A new year means a fresh new start. If you are hunter, there are many aspects to improve upon, from your health and your skills as a hunter to the companionship between you and your hunting dogs. Think about your involvement with hunting and how you can become an even better sportsman. There are many things you can do in 2017 to improve your skills and your bond with your four-legged hunting partner. Hunting is a sport that is easiest when both you and your dog are in shape. Be sure to regulate your dog’s diet and make sure they get plenty of exercise. Lean dogs at a healthy weight tend to live about two to three years longer than out-of-shape dogs, says Slim Doggy. Hunting is a sport and your dog is an athlete. It is also important to remember your own physique. You and your dog are teammates and you need to be on the same athletic page. Be sure to diet and exercise with your pooch. Think of it as hunting practice with your team. Conservation is also integral. A good hunter knows that balance is key and it’s important to maintain the lands you hunt and protect the wildlife there for future generations. Take some time in the new year to get involved in wildlife conservation as a way to protect nature, and ensure that hunting is available for generations to come. Putting energy into conservation will also make it more special to teach hunting to the next generation, which is another great resolution for the new year. By teaching your son or daughter or niece or nephew how to hunt, you are helping the tradition live on. It is also a wonderful bonding experience. There is no better way to grow your team than to pass down the skillset of hunting. Taking a child who is new to hunting with you and your dog out on the hunt is a great way to grow the ranks of sportsmen. No hunter is too experienced for a safety refresher. Start off the new year by retaking your hunter’s safety course, recommends Outdoor Life. This is especially important if it has been a decade or more since you last took the course since there’s a good chance that some of the rules you may have originally learned have changed and safety has been improved. It is your duty to brush up and stay in the know and retaking the course is a great way to stay up on the latest. Plus, if you’re introducing a child to hunting, this can be a good way for both of you to get on the same page for safety. At KT British Labs, we have a wide variety of started British Labrador hunting dogs and young puppies available. 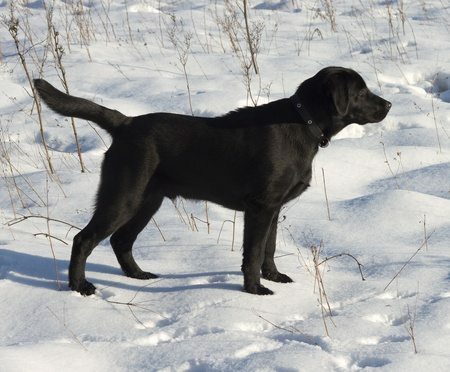 These dogs make excellent hunting partners and wonderful companions for you and your family. Learn more about our available dogs online or call us today at 218-685-5103.